"Animalball Melee is a simplified d20 combat engine for quick and easy gladiator fighting. While it can be used for a full-fledged roleplaying campaign, Animalball Melee is intended for one-shot, pick-up-and-play combats. An homage to the Fanatasy Trip's original game, Melee, Animalball Melee is takes the d20 combat system and boils it down to its bare essentials to streamline combat. "Animalball is designed as a pick-up-and-play game. As author Mike Jones commented, "For players who are familiar with other d20-based Open Gaming products, Animalball Melee will likely be an experience that is simultaneously unique and familiar. The well-known Open Game elements are there, but everything superfluous has been stripped away until there is nothing left but pure physical combat." 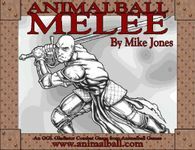 "Animalball Melee is a 32 page stand-alone game of gladiator combat which utilizes a simplified d20 rules-set. Animalball Melee is suitable for two to six players." Animalball Melee is a set of alternate man-on-man combat rules for the d20 system, heavily influenced by early Steve Jackson games such as The Fantasy Trip and Melee.